Our Cricket powder is made from 100% Canadian raised crickets which have been whole roasted before being milled into a fine powder. Each 15g pack contains around 9 grams of protein making it a great way to boost your morning protein intake by adding it your smoothies or try swapping up to 10% of your usual flour when making cakes and biscuits. People with a SHELLFISH allergy must consume crickets with caution as there are distant relations between some insects and prawns/ shrimp. 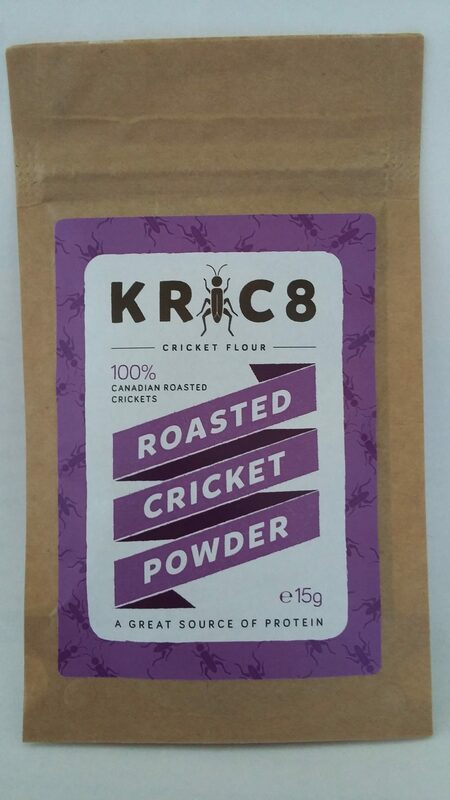 Kric8’s Cricket powder is made from 100% Canadian raised crickets. The adult crickets are between 6 and 8 weeks old before they are harvested before being cleaned and processed into a fine powder. Whole crickets are high in protein, iron and B12 as well as containing all 9 essential amino acids. Allergy Warning: People with a SHELLFISH allergy must consume crickets with caution as there are distant relations between some insects and prawns/ shrimp.